More than 120 pregnant females were among hundreds of whales slaughtered in Japan’s latest hunt in the Antarctic, prompting condemnation and calls for international action. A total of 333 minke whales were killed as part of the country’s so-called “scientific” whaling programme, which carries out an annual summer hunt in the Southern Ocean. Among those slaughtered, 122 were pregnant and another 114 were juveniles, according to documents from a meeting of the International Whaling Commission’s (IWC) scientific committee this month. Japan has signed the commission’s moratorium on whale hunting, but Tokyo exploits a loophole each year by saying its hunt is conducted for scientific research. Critics say the research is actually a cover for commercial whaling, as the meat from the harpooned mammals is later sold to be eaten. “The killing of 122 pregnant whales is a shocking statistic and sad indictment on the cruelty of Japan’s whale hunt,” said Alexia Wellbelove, senior program manager at Humane Society International. “It is further demonstration, if needed, of the truly gruesome and unnecessary nature of whaling operations, especially when non-lethal surveys have been shown to be sufficient for scientific needs,” she added. Two Japanese vessels were involved in last summer’s hunt, which targeted the whales using harpoons loaded with a 30g penthrite grenade. The slaughtered animals were taken on board the boats, where researchers took measurements and collected data on their blubber and stomach contents, according to the IWC papers. Japan’s fisheries agency collects the data and reports the findings to the commission. 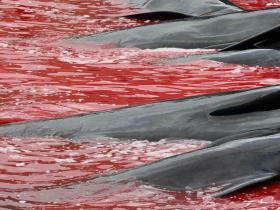 It says the programme is carried out in accordance with the International Convention for Regulation of Whaling. “Whales are already facing substantial threats including bycatch in fisheries and marine pollution,” Ms Wellbelove said. ”Significant conservation efforts are underway worldwide to address these issues, so the least Japan could do is put away the harpoons. Previous articleAre you being ripped off by the gig economy?